Help your fruit-loving backyard birds thrive with the Pine Tree Farms Log Jammer Berry-N-Nut Suet Plugs. These convenient plugs offer your backyard birds a mixture of suet, berries, peanuts, and corn, for a wealth of nutrients and flavor. The dried berries attract birds which enjoy fruit, while the rendered beef fat helps them maintain their high metabolisms. These suet cylinders are specifically designed for use with your existing Pine Tree Farms Log Jammer Suet Feeder (not included), adding a natural feeding station to your yard. Place the log on a platform feeder for more versatility. 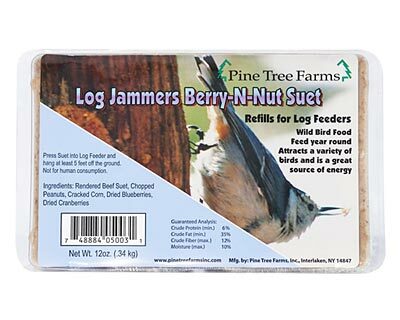 Feed suet in a convenient and exciting way with the Log Jammer Berry-N-Nut Suet Plugs. Made in the USA. Note: This case pack contains twelve 3-packs of the Pine Tree Farms Log Jammer Berry-N-Nut Suet Plugs.